Les oeuvres d’Ambroise Paré…. 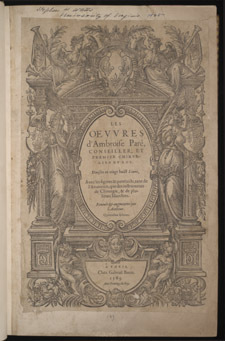 Paris: Chez Gabriel Buon, 1585. Ambroise Paré, Les oeuvres d’Ambroise Paré…. 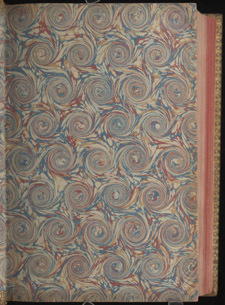 End paper with gold-stamped border. Ambroise Paré, Les oeuvres d’Ambroise Paré…. In 1925 the owner of this book inscribed his name at the top of the title page which features classical elements including cherubs and crowns. Ambroise Paré, Les oeuvres d’Ambroise Paré…. 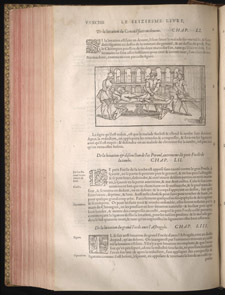 An elegant page with illustrated header and historiated initial. Ambroise Paré, Les oeuvres d’Ambroise Paré…. Patient’s muscles are manipulated with pulleys. Ambroise Paré, Les oeuvres d’Ambroise Paré…. Surgical instruments. Ambroise Paré, Les oeuvres d’Ambroise Paré…. Mechanical hands. Ambroise Paré, Les oeuvres d’Ambroise Paré…. Crutches. Ambroise Paré, Les oeuvres d’Ambroise Paré…. Des Monstres. 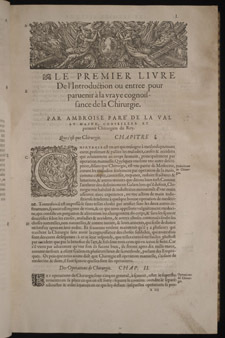 Ambroise Paré, Les oeuvres d’Ambroise Paré…. 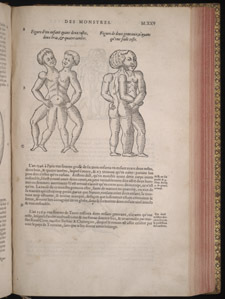 Conjoined twins shown in Des Monstres. Ambroise Paré was a French surgeon who was apprenticed at an early age to a barber and became a barber-surgeon. He spent most of his life as an army surgeon, and he successfully devised innovative military surgical procedures. 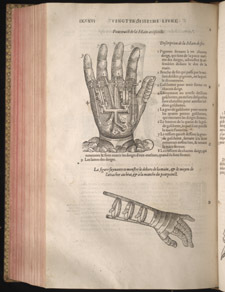 Paré was the first to notice that the usual practice of treating gunshot wounds with boiling oil was detrimental: instead he tried applying ointment and bandaging the wounds. 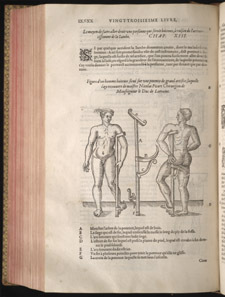 Rather than cauterizing amputated limbs he used ligation (tying blood vessels). Paré performed many successful experiments and made astute observations about what he saw. 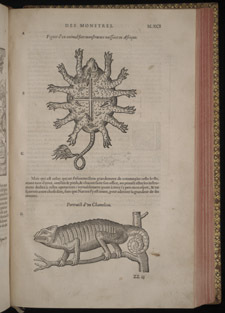 His 26 books, including Des Monstres, a book filled with stories about sea devils and other monsters, were compiled into this large volume, which was translated into several languages, including Latin. That Paré did not know Latin irritated the learned physicians of France, who feared that lowly surgeons untrained in classical languages might become their rivals. 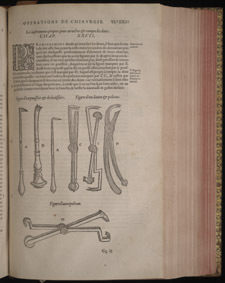 next author: Andreas Vesalius (1514-1564).